Dr. Jose C Hernandez was born and raised in Pasadena, CA. His father is a practicing surgical oncologist in Los Angeles and continues to be a role model in his life. He completed his undergraduate education at UCLA and his medical education at the University of Michigan-Ann Arbor. He went on to complete a fellowship in Gastroenterology at the Mayo Clinic where he conducted several research endeavors focused on diseases of the esophagus. Prior to joining CCG, Dr. Hernandez was in a busy private practice in Monterey County. His interests include treatment of Hepatitis C, Inflammatory Bowel Disease, and general endoscopy. He is dedicated to a compassionate approach to his patients. 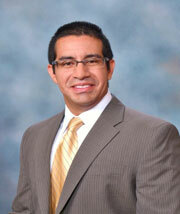 Dr. Hernandez is fluent in Spanish and currently accepting new patients. His wife and two young children are excited to join our community. This information is intended only to provide general guidance. It does not provide definitive medical advice. It is very important that you consult your doctor about your specific condition and/ or your specific preparation for the procedure.